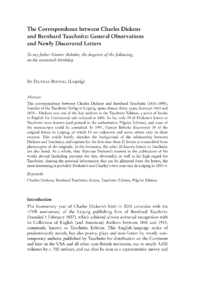 The correspondence between Charles Dickens and Bernhard Tauchnitz (18161895), founder of the Tauchnitz Verlag in Leipzig, spans almost thirty years, between 1843 and 1870  Dickens was one of the key authors in the Tauchnitz Edition, a series of books in English for Continental sale initiated in 1841. So far, only 29 of Dickenss letters to Tauchnitz were known (and printed in the authoritative Pilgrim Edition), and none of the manuscripts could be consulted. In 1991, Gunter Böhnke discovered 34 of the original letters in Leipzig, of which 14 are unknown and seven others only in short extracts. This article briefly sketches the background of the relationship between Dickens and Tauchnitz, and reprints for the first time these 21 letters as transcribed from photocopies of the originals. In the footnotes, the other 22 known letters to Tauchnitz are also listed. As a whole, they illustrate Dickenss interest in the publication of his works abroad (including payment for this, obviously), as well as his high regard for Tauchnitz. Among the personal information that can be glimpsed from the letters, the most interesting is probably Dickenss son Charleys two-year stay in Leipzig in 18534.